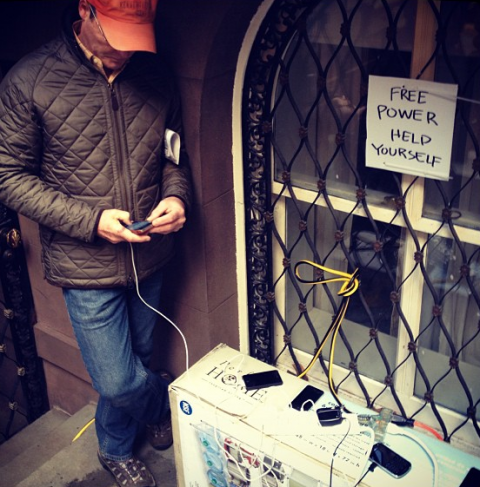 It’s been days since Hurricane Sandy hit, but we’re still feeling the effects of it, here in NYC. Downtown Manhattan and many other neighborhoods are still dark. Mal and Peter and lots of my friends and co-workers are still without power and hot water. And, very tragically, one of the storm’s victims was a friend of the family and another was a friend’s former classmate—which has made this event all the more sad. As for me, I was definitely one of the lucky ones. Sure, I wasВ cooped up in my apartmentВ for a few days, trying not to go stir crazy. But I never lost power, hot water, cell phone service or the internet—so I really have nothing to complain about. Throughout all this, I was touched by the ways New Yorkers helped each other out—like in the photo below. I heard many stories of friends who opened their apartments to others and offered showers, dinner, flashlights and electricity to those who’ve been going without. I had a moment of my own yesterday, when a stranger’s words made my day and helped me forget my hurricane-related stress. Since buses were running in Manhattan, I felt that I had to go to work, despite the fact that I live way uptown on the west side, not anywhere near my midtown east office. Plus, I wanted to get out of my apartment. So in the morning, I boarded a bus and hoped for the best. I walked into my office 4 hours later. Traffic was insane. I stood for hours and listened to episodes of “This American Life” as the bus crawled through Harlem; we spent more than an hour going from west to east on 110th Street, alone. At 86th and 5th, I finally gave up and walked the home stretch to 50th and 3rd. I was fried from that commute. The thought of having the same experience going home was so daunting that I decided to go to ballet and head back late, after rush hour was over. It turned out to be a good plan. At 10:30 p.m., I was tired, hungry and worried about how long it would take to go the 130 blocks home, but I managed to squeeze onto a packed bus. The driver was super-nice and, at every stop, implored everyone to move back so he wouldn’t have to “leave any New Yorker behind.” At one point, I scored a coveted seat, but then gave it up when I saw an older gentleman and his female companion get on. While I stood next to their seats, the woman turned to me and said, “I would be happy to take your bag on my lap. It looks so heavy!” And then, when she saw that it was full of ballet stuff, she asked if I was a dancer at the Met. I declined her offer but was so touched by her kindness (not to mention flattered that I’d been mistaken for a professional ballet dancer) that I was smiling for the rest of my trip home—which included waiting in the cold for another bus, dealing with a very not-nice driver who cursed at every rider who got on, unexpectedly being dropped off at 135th Street when that driver decided he was done for the night, waiting for another bus, then finally giving up and hailing a gypsy cab that almost got into a fight with another gypsy cab who bumped our car. It’s amazing how powerful a few unexpected, kind words are. How have you weathered the storm? I hope you stayed safe and dry. And if you were affected, my thoughts are with you. Never lose faith in humanity… even though sometimes you are really really tempted to! It’s so true! When things get really tough, people are there for each other. So glad you made it out okay! Where I am in MD wasn’t hit too hard, but I can’t believe how devastating the damage has been elsewhere. It’s been awhile since we’ve seen NYC look so vulnerable. But it is nice to see how strangers come together in situations like this. I’m so glad to hear your area wasn’t badly affected, Cassie! And yes, it really is great to see the many ways people help each other out in these times! Been meaning to contact you all week, so glad to read your posts here – and that, stir-craziness aside, you’ve been OK. I lost power for about 8 hours Monday in Cambridge (Mass. ), but that’s been the worst for me. Friends in Newton, though, lost power Monday and just got it back last night, ugh. Oh, *love* the ballet bag story! Hi Mirto! SO glad to hear that you weathered the storm okay in Cambridge, despite the loss of power. It sounds like some parts of Mass. were affected more than some places in NYC–and I really was lucky compared to how others have fared!